Boosting your kids up could save their life Give your kids a boost! The summer driving season is just around the corner! 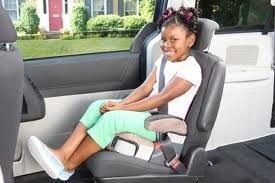 It's a good time to remember that using a booster seat for your children ages four to eight can save their life. According to the National Highway Traffic Safety Administration, the leading cause of death for children ages four to eight is automobile accidents. While many of us take extraordinary steps to feed our kids right, and keep all sorts of dangerous chemicals away from them, we forget that the most dangerous thing we do every day is drive! Because seat belts are designed for adults, they do not fit children properly. Children aged four to eight are simply too small for adult sized seat belts. Instead of restraining a child's chest and lap during impact, the adult seat belts cut across a child's neck and abdomen. Using a booster seat ensures that the seat belt fits properly over a child's chest and hips by boosting the youngster three or four inches. These precious inches could be the difference between safety and danger! In the event of a collision, an improperly seated child can have his or her neck broken by the seat belt, or receive injuries to internal organs. According to the American Academy of Pediatrics and the NHTSA, using a booster seat increases your child's chances of surviving an accident injury free by nearly sixty percent! As soon as your child outgrows their forward facing child seat, you should move them to a booster seat. If you are unsure, check the owner manual of your child seat for the weight and height restrictions. Remember, you should always install the booster in the rear passenger seat. When selecting the appropriate booster, make sure that the shoulder belt lies across the middle of the chest and shoulder, not the neck or face. The lap belt should fit low and snug on the hips and upper thighs, not across the belly. Most children will need to be in a booster seat until they are four to nine feet tall - which may not happen until they are twelve. By then, it may be a fight to get them to use a booster. But remember, the safety benefits are worth the slight inconvenience! There are a few tricks you can use to encourage your kids to use booster seats. First, let them decorate the booster with stickers so they can personalize it. They will be much more likely to want to use the booster seat if they feel they can make it theirs! Second, when you first switch your children over to a booster seat, make sure to emphasize it as graduating to a better seat for big-kids. Let them know that with a booster seat they will be able to see out the window like an adult! Lastly, you can set a rule that only kids sitting in their booster seat can watch movies on the rear seat entertainment DVD system. Once they realize how much fun they are missing by not being able to use wireless headphones to watch a movie during a road-trip, they will be begging to get into a booster-seat. Do you have any safety tips for children while driving? Share them with our community by posting below!